Thus the first question becomes: Why them? After all, the most sensible arrangement would presumably have been a chronological one, beginning with the Greek and proceeding forward. Instead, these three colonial Americans lead the charge and while most people know Ben Franklin (as a Founding Father, or as the funny-looking guy who nearly electrocuted himself or as the name of a dollar store), William Penn has been relegated to history (you might know him as the founder of Pennsylvania) and John Woolman qualifies as a historical ghost. While it’s not exactly an enticing line-up therefore, it doesn’t strike one as daunting either. The reason behind this selection appears to have been ideological. For Charles W. Eliot these three men, in at the ground floor as the nation was establishing its identity, combine to form the Ideal American – one who is intelligent, practical, pious, works for the common good and stands for human rights. So, cutting to the heart of the matter, what does Benjamin Franklin (1706-1790) all on his lonesome offer with an Autobiography he didn’t even finish? His Autobiography (first published 1791, first reputable version not appearing until 1868) was begun in 1771 for his son – paternal advice as it were. That renders it a dubious narrative all by itself and though he later on resumed it for its own sake, he came nowhere near finishing it. It ends just when he was becoming “important.” So what you get here is slightly trivial but extraordinarily entertaining and only 170 pages long in the Harvard. Franklin is famed for his table-talk and this is about as accessible as the Five-Foot Shelf gets, so cherish it. Among its subjects is a particularly beautiful example regarding education. 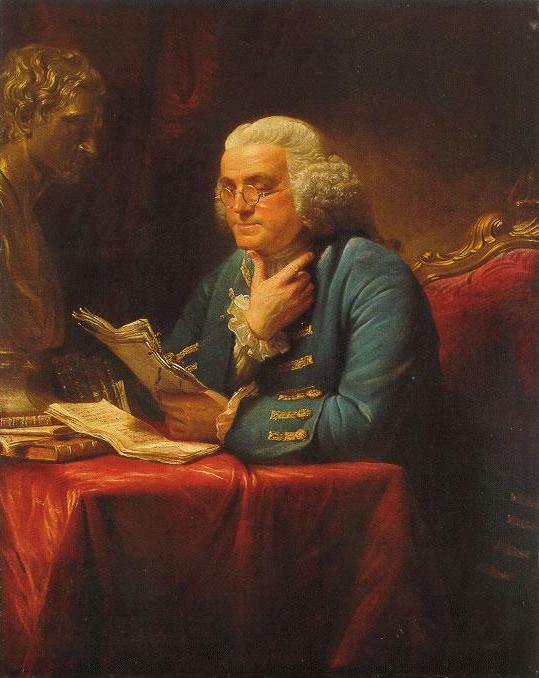 Franklin did not attend Harvard, his father considering it too expensive and perhaps not worthwhile. Also, Franklin went to work as an apprentice at ten years of age so he only got two years of standard schooling (roughly the same amount I got, incidentally, so I identify with the self-taught aspect – not that we have anything else in common). Franklin sums up all the virtues of the self-made man. He was dedicated and taught himself to write well, using his spare time for study and education; reading, by the sound of it, whatever he could get his hands on. My time for these exercises and for reading was at night, or on Sundays, when I contrived to be in the printing-house alone, evading as much as I could the common attendance on public worship which my father used to exact on me when I was under his care, and which indeed I still thought a duty, though I could not, as it seemed to me, afford time to practice it. And, lastly (I may as well confess it, since my denial of it will be believed by nobody), perhaps I shall a good deal gratify my own vanity. Indeed, I scarce ever heard or saw the introductory words, “Without vanity I may say,” &c., but some vain thing immediately followed. Most people dislike vanity in others, whatever share they have of it themselves; but I give it fair quarter wherever I meet with it, being persuaded that it is often productive of good to the possessor, and to others that are within his sphere of action; and therefore, in many cases, it would not be altogether absurd if a man were to thank God for his vanity among the other comforts of life. Let’s examine that more closely. He starts out admitting to a fault (his ego) and rounds out with an extremely dubious moral statement (is vanity really so beneficial as he presumes?) but he gets away with these things through the use of a good-natured wryness; through the insertion in the middle of a dead-on blow to an hypocrisy we’ve surely all witnessed and which he has already ducked out of by his admittance at the start; and through his further declaration of tolerance in the case. He even skates through the vanity-is-good section by attaching the word “altogether” to his theory as a gentle caveat. In short, it’s a completely manipulative statement but it can hardly fail to charm anyway. When you factor in that he was raised by Boston Puritans, you’ve got one of the great historical ‘characters’ on your hands. What made Franklin one of the great historical ‘personages,’ however, is that he was a late-to-the-party Renaissance Man. He invented bifocals, founded the University of Pennsylvania, invented the glass ‘armonica, began the first American lending library and the first American volunteer fire brigade, invented the Franklin stove and is the only non-president to grace our dollar bills. That’s not counting his political life, his scientific experiments or his great skill in the printing and newspaper business which he thoroughly recounts herein. The affairs of the Revolution derailed the Autobiography, and the end result of his first attempt is a little book giving emphasis to the virtues of industry, temperance, good education, hard work and honesty (never mind the subterfuge he sometimes engaged in) while overusing the word “ingenious” (I count 19 instances altogether, though most are directed toward others than himself). However, he also seems to have been genuinely grateful for his good fortune and not all the humility appears put-on. Also, Franklin’s writing is often droll. For example, when he collaborated with the printer Keimer on an idea for a new sect: Keimer wore his beard at full length, because somewhere in the Mosaic law it is said, “Thou shalt not mar the corners of thy beard.” He likewise kept the Seventh day, Sabbath; and these two points were essentials with him. I dislik’d both; but agreed to admit them upon condition of his adopting the doctrine of using no animal food. 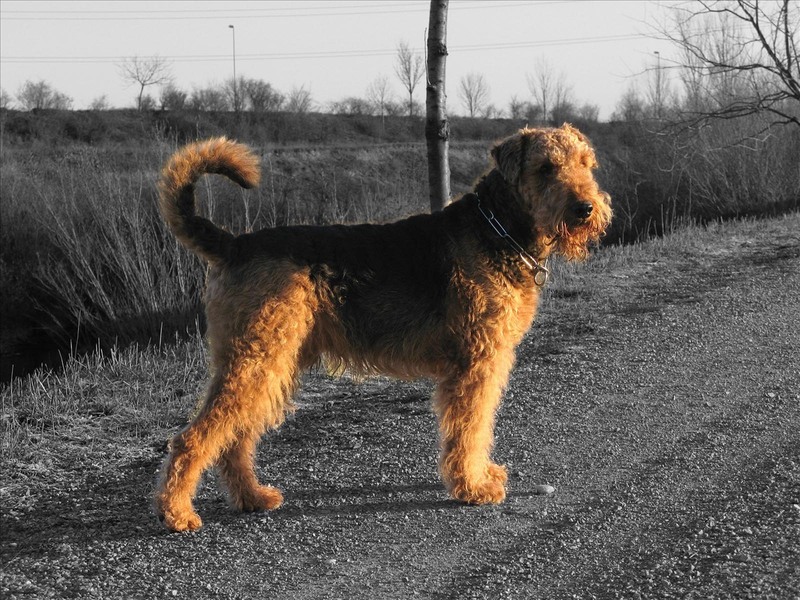 “I doubt,” said he, “my constitution will not bear that.” I assur’d him it would, and that he would be the better for it. He was usually a great glutton, and I promised myself some diversion in half starving him. “In the Middle Ages, Franklin, if such a phenomenon as Franklin were possible in the Middle Ages, would probably have been the founder of a monastic order.” Footnote from The Harvard Classics. While the lion’s share of the text is given to public services and self-improvement, later the French and Indian War gets mentioned and thus war anecdotes appear regarding the building of forts, the raising of militias and taxes, and the shameless behaviour of the British sent over to fight – sharp jabs given to the corruption and abuse of power in both military and governmental offices: [Captain Bonnell] told me that, when he had been detain’d a month, he acquainted his lordship that his ship was grown foul, to a degree that must necessarily hinder her fast sailing, a point of consequence for a paquet-boat, and requested an allowance of time to heave her down and clean her bottom. He was asked how long time that would require. He answered, three days. The general replied, “If you can do it in one day, I give leave; otherwise not; for you must certainly sail the day after to-morrow.” So he never obtain’d leave, though detained afterwards from day to day full three months. F or some, Franklin is the man to blame for America’s failures, as the original archetype of the practical man of business, blindly pursuing money and success, an insincere schmooze obsessed with bettering his status. 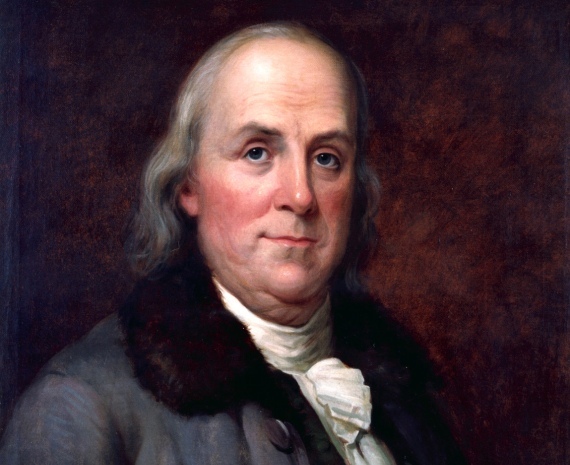 Franklin, however, insisted upon frugality and industry, common sense, good works that would be of benefit to other people and self-improvement. To blame him for the followers who failed at emulating that second and equally defining set of properties is very unfair to the man. In fact, my favorite quotation from the book, ever since I first read it back in 2009 (this blog post heralding my third time through it), has been this: Human felicity is produc’d not so much by great pieces of good fortune that seldom happen, as by little advantages that occur every day. Thus, if you teach a poor young man to shave himself, and keep his razor in order, you may contribute more to the happiness of his life than in giving him a thousand pounds. The money may be soon spent, the regret only remaining of having foolishly consumed it; but in the other case, he escapes the frequent vexation of waiting for barbers…he shaves when most convenient to him, and enjoys daily the pleasure of its being done with a good razor. So much for Franklin the dollar-fiend. The Autobiography ends with jarring abruptness and that is really the greatest misfortune for so enjoyable and thoughtful a text. It is a shame he couldn’t finish it but even as it stands it is worthwhile. What does it offer to Eliot’s purpose of education? The example of a self-reliant life. For me, this guy is one of my heroes, offering direction in a postmodern slacker landscape. For the rest of it, it offers up a first-hand account of the social mores and living patterns of Colonial America which, when combined with a wry narrative, makes for an interesting read all by itself. In short, this is one of the Harvard selections which I would wholeheartedly recommend reading for its own sake. 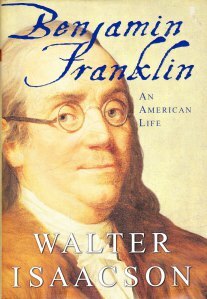 Those curious for his further and unvarnished exploits may wish to check out Walter Isaacson’s Benjamin Franklin: An American Life, a pop biography of some length and very enjoyable in its own right. 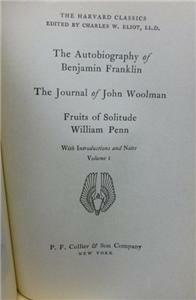 Franklin fans should probably get hold of his further writings in the Library of America (which I might do). Up next: The Journal of John Woolman.